Honduras Santa Elena Catracha Ernesto Vazquez now in-house! We really loved this coffee A LOT last year, so much so that when the 2016 harvest microlot was announced we got the whole 14 bags of it. Please read more (in the product description) about the Catracha Project and Royal Coffee's commitment to making a real difference in this hard-working community, Santa Elena, population 12,000, with more than 60 individual growers. Thank you Ernesto and family and all of the greater Catracha family. We've been so jazzed to get a small taste of this AA microlot SL34 from grower Matthew Mugo in Kiambu. His Riamute farm ("Abundancia") is one of the finest in Kenya, and soon enough we'll be tasting the even more-prized and total rarity Natural process..check back here! Excited to greet awesome newbie Sumatra Mangkuraja Estate (from South Sumatra...a first for us), boisterous tones of vanilla, licorice, cocoa and molasses. Ethio Chelbessa natural better than ever, fruit-bomb. Organic Java Taman Dadar one of our longest-running Indonesian coffees, consistently excellent. Special microlot of Kenya AA (SL34) arriving Monday...keep posted! Badbeard's Coffee Milk Stout on tap locally! 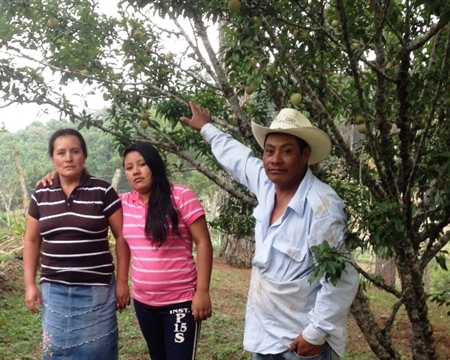 Coming arrival of new crop Honduras from Ernesto Vasquez, Mayra Orellana-Powell speaks! Got word this week from Mayra Orellana-Powell, marketing manager of our esteemed partners/importers Royal Coffee, that our fave producer, Ernesto Vasquez (farm "El Durazno Melocoton") of the Catracha Coffee Project in Santa Elena, Honduras, produced an excellent lot and it will be making its way here soon. Fantastic coffee...the one we used to produce a coffee beer with collaboration of Jason Webb of Portland's Unicorn Brewing....chocolatey, lively acidity, banana leaf, vanilla. Can't wait! This coffee will make it into our offering sheet as well as the next production run of Badbeard's Coffee Stout, which is currently on tap at the Beaverton Market of Choice. Mayra is doing amazing things...REAL "eco-activism" for her hometown community of Santa Elena...here she is addressing an SCAA assembly. Thanks Mayra and husband Lowell Powell and all the besties at Royal! Also excited to have Keffa Coffee's new crop YirgZ and Limu-Gera back in the rotation. The washed Limu was one of the highest-scoring coffees from that area ever handled by Samuel Demisse, a jammy fruit bomb normally reserved for natural process cultivars. Bravo. Fantastic pourover and espresso. Last week we attending a massive cupping of Colombian coffees from exporter/importer Traviesa Coffee showcasing their 31 (!) new offerings. The microlot of Yellow Bourbon from Finca Manantiales del Frontino cupped beautifully so I got the entire 3 bag lot. Despite its botanical proximity to our Red Bourbon from that fantastic farm it tastes quite different...floral as well, but strong notes of vanilla and citrus/candied orange peel. Kind of like a fragrant Orange Julius! Manantiales del Frontino won the SCAA best of cupping competition in 2012 and you can see why in these coffees...the Yellow and Red Bourbons and Geisha, which we also picked up because we love it so much! 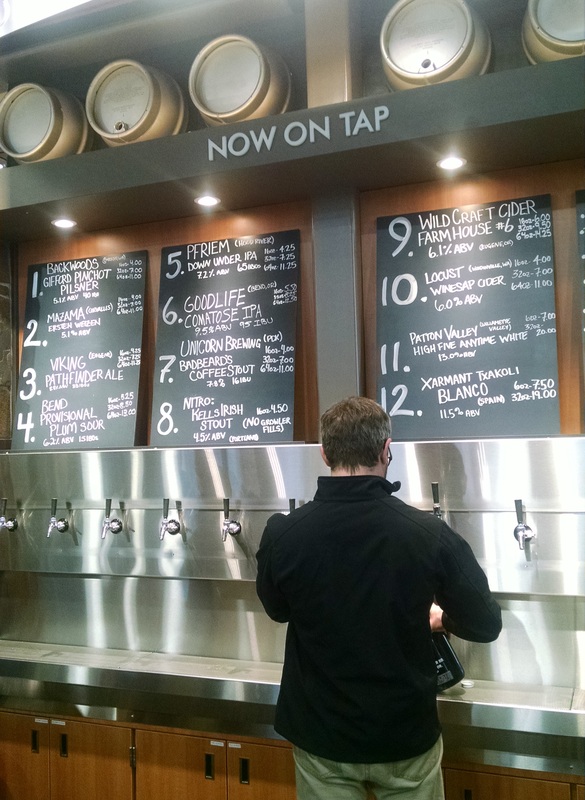 Coffee beers extravaganza in Portland Saturday March 12! The presence of our Honduras Santa Elena Catracha "Ernesto Vasquez" is going to be in evidence on Saturday March 12 at the Baker's Dozen coffee beers/donuts/coffee event held at Culmination Brewing in NE Portland. Excited! Brewers John Lovegrove and Jason Webb of Unicorn have done an excellent job jacking up thier Milk Stout with this prized, chocolatey coffee! A preview here from last night's pre-show promo and tasting of some of the offerings. The municipality of Santa Elena in Western Honduras is located in the department of La Paz, at an elevation of 1,800 meters above sea level and is very near the border with El Salvador. Most of the Catracha farms are located in this region, and many with long views down the valley below. If you start at the family home of Mayra Orellana-Powell, marketing manager for Royal Coffee and co-founder of Catracha, and depending on which road you take around the mountains, the terrain, landscape, plants, and farms will change dramatically. You may remember the details of this project: The municipality has approximately 88 square miles and a population of 14,800. Coffee is grown between 1,500 and 1,800 meters above sea level, and we think the quality is very high. Catracha Coffee is a coffee-buying social enterprise that accesses the specialty coffee market for smallholder farmers. The quality project is an initiative focused on supporting the production of specialty coffee among Catracha Coffee farmers in Honduras. As I’m writing this, data loggers are running on four farms, in the solar dryers, and near drying patios—installed by farmers (Rosibel Vasquez, Santiago Lopez, Luis Nolasco, and Porfirio Lopez) with the help of Arvin Juan and Lowell Powell with Catracha. 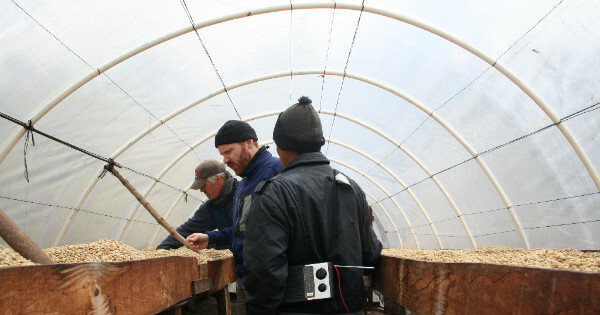 Arvin and Lowell have also encouraged farmers to add more ventilation to their solar dryers and use breathable black mesh under the coffee parchment while it dries to promote slow and even drying in an easy to clean environment free of unwanted contamination. “People believe drying coffee in 5 days is good because it opens up space to dry more coffee, so the challenge is to convince a producer that 15 days is better because the quality will be better,” Lowell said to me. The intention of the data loggers is this: they will map the post-harvest process and collect data at each step, from receiving, pulping, fermenting, drying, and storage. “Many farmers have their particular way of doing things, and our goal is to capture the uniqueness from farm to farm so we can learn from each other and get even better,” said Orellana-Powell. In its first year, Catracha worked with 13 farmers. The following year it was near 30 producers and Mayra is estimating closer to 60 people this year. This is evidence of a great buy-in from people on the ground in Honduras. I had a chance to get the perspective of some of the coffee buyers on this trip (who, I should add, have been offering extremely valuable guidance and support for this project). Many of the buyers agreed that the social aspect of this project—the community building, the focus on transparency, bringing more money back to the producer—is as appealing as the quality aspect of the project (which again, we think is pretty great). The organizing, the market connection, the producer investment is all happening in an exciting way. What is special about Santa Elena? So many things, but not the least of which is the coffee. The work is beginning, and it is important that Catracha can show continued improvement in quality over the coming years. I’d like to sketch out how we are going to track that progress. Let’s start with what is happening on the coffee farms. I mentioned some of the ways that data is going to be captured. This is important, baseline information. Going forward, when Catracha experiences quality outliers—coffee that exceeds or does not meet expectation—Catracha should be able to drill into the processing and farm information to identify why and adjust its methods. This will be valuable feedback for farmers and can help explain quality variance, something that can be a mystery. Giving advice to farmers in Santa Elena based on successes seen in other growing regions of the world could be risky because every growing region can have its own unique micro-climate and favorable factors that are not necessarily transferable to Santa Elena. Having data to analyze before suggesting possible strategies for quality improvements will reduce costly mistakes. This project is bringing together individuals from wide ranging backgrounds. There are, of course, the coffee professionals. The Catracha team is being guided by advice from experienced coffee buyers. There is a pretty healthy debate happening within the Catracha community about processing techniques, pricing and transparency. And most importantly, Catracha will work with close to sixty producers this year, almost double from 2015. According to Lowell and Mayra, the new additions to the Catracha group have been wonderful to work with and their coffee looks spectacular.